Have you ever heard of the phrase "canary in a coalmine?” Coal miners used to take canaries into coal mines where they acted as early-warning signals for toxic gases or fumes. If the birds became sick, or died, miners would have quality of the air they were breathing. 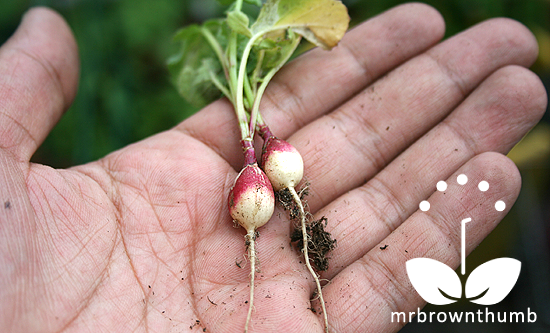 You can do something similar to test the quality of your garden’s soil by growing radishes. While growing radishes to test your garden soil will not give you any insight into toxins located in soil, this experiment can give you insight into what is lacking in your garden’s soil thus saving you time, money and a lot of heartache before you begin planting. 'French Breakfast' radishes 90 days after planting seeds in generic potting soil from Home Depot last year. No wonder the French are so thin-- look at the tiny vegetables they eat! I first learned about growing radishes in the garden to act as living soil testers from reading The Bonsai Workshop by Herb L. Gustafson when I grew bonsai in the late '90s. Bonsai grow in small pots with minimal amounts of soil; because of this, much consideration goes into to the quality of the soil the plant material is growing in. Using radishes to test your garden soil is easy. All you need is a handful of inexpensive radish seeds, a container garden, raised bed or plot of land that has soil you are unsure of. Maybe you have inherited the soil in your community garden plot, or maybe you cannot remember when you last amended the soil in your container garden. Whatever the reason, this trick will give you some insight into what is in your garden’s soil. 1. Plant the radish seeds in the soil you want to know more about by following the directions on the seed packet your radish seeds came in. 2. Water your seeds and keep them moist until they sprout. 3. Once you have seedlings continue to tend to them as if you were going to eat them, but do not fertilize! 4. Observe your radish plants carefully as they grow. Watch for pests or diseases and take notes. You are playing a garden detective and your observations here will be important. 5. Within 30 days your radishes should be ready to harvest. If your radishes matured and you harvested a healthy crop, your garden soil is good to go and you are ready to plant. Although, it would not hurt to freshen up the soil by added compost or choosing a fertilizing regiment that is appropriate to your needs. If your radishes fail to produce a vegetable root but grew a lush, healthy top that means that the soil lacks phosphorous and potassium. Yellow, unhealthy-looking (chlorotic) leaves tell you that iron, sulfur, nitrogen and other trace minerals are lacking in your soil. You will have to amend for these deficiencies as needed. Here's an example of a radish I grew in Happy Frog potting soil. Do you see the difference between this radish and the radish I grew up in generic potting soil? It was the same type of radish. From the same seed source, even the seeds came from the same seed packet. The difference was in the quality of potting soil I used. Radishes are great to use in this experiment because the seeds are cheap, sprout quickly and are sown directly into the soil early enough in the garden season that you still have time to do something about the condition of your soil before the gardening season gets going. In the time that it took the 'French Breakfast' radishes to get to size pictured above, I could've had three harvests if the soil had been any good. Testing your garden soil by growing radishes is not an alternative to testing your garden soil for the presence of toxins. Contact your nearest Cooperative Extension office for information on how to test your soil for toxins. I often say that bonsai taught me everything I need to know about gardening. If you can keep a plant alive and healthy in such a small pot then you can grow just about anything. This is such a great test. You know, last year I grew a lot of radishes in the ground, and some never grew a radish, only leaves. I thought it was because the ground was too hard. Any thoughts of what caused that? But there is another possibility: radishes will not produce good roots, only top growth, when temperatures are too high. This is great info, thanks for sharing! Brilliant! I had wondered why my radishes last year produced lots of leaves but little tiny roots. I'm definitely glad I read this. @Meemsnyc, The lush growth and no root is suppose to be indicative of soil that doesn't have enough phosphorous and potassium. But I guess it is possible your radishes didn't grow because your soil is too compact. Although, there's this blog (mustardplaster.blogspot.com) that I read who posts a lot of root crop pictures. And in her blog pics they show that when the roots hit the hard surface they just start growing at an angle. So, I think even if your soil was too hard the root would probably angle itself to keep growing in the more loose portion of the soil. @Elaine, You're welcomed. Hope you find it useful! @Mud, Glad you too found it useful! What great information. Radishes. I've always loved them. Here's one more reason. Wow ... I'm fascinated. Very interesting. I’m going to give this a try. Thanks! In the Chicago area, would this be a good time to start radish seeds? @Gardener on Sherlock Street Right? Is there anything radishes can't do? Radishes are best! @Erin, I had the same reaction the first time I did this test with bonsai soil when I read about it in the book mentioned above. @Linnea, Yes, you can plant radishes now in the ground/soil in the Chicago area if you want to try this experiment/tip. Great tip. If everything goews well, we can eat the radishes, too! So happy to have found your blog! This post is fascinating. I have never heard of the radish test but I'm certainly going to try it. very cool! I think you are right with the lack of nutrients. This year we are growing radishes in raised beds. So I'm looking forward to seeing the results of that. This is simply amazing, Mr. Brown Thumb! I'll have to try it in my raised beds. Thank you! This sounds like a great experiment, but I have already fertilized and composted my veggie bed. Seeds are in and just sprouting so we will see what I get. I do not always get a good crop of radishes. A friend told me once that I should plant radish seeds according to the moon (Farmers Almanac). I hate eating radishes but I'm going to plant some just to test the soil. Great idea, I must try this in my new garden area. I love that it's quick & easy and you can possibly eat the rewards (if they size up properly). I usually try to take notice of the way plants are growing to see if there are deficiencies, usually you can tell. I never would have thought of this test - very interesting. I will have to give this experiment a try this year! How interesting! My radishes were less than successful last year, as well as other plants - I chalked it up to planting late. I will definitely see about getting my soil tested. I'll have to shovel the snow off the yard first, and then maybe get the torch out to do some thawing of earth, and finally fence off the area so the bears and moose don't get into it. Yes, after that, I want to try the radish experiment. I've never heard of this before, and I've been growing vegetables for more than 40 years. What a fantastic tip! The radishes here, while not nearly as tiny as yours in the photo, tend to be smaller than I'm used to growing. I've attributed it to the fact that I don't have enough sun. Even though my beds are loaded with nice, rich compost, I'm definitely going to look for organic source(es) of phosphorus and potassium to amend the soil. I'm excited to see if it will make a difference and give me the nice, fat radishes I used to grow, in spite of being a bit short on sun. Great idea! I can't wait to harvest my radishes now! Well, I already couldn't...but this is a great idea! Love it! You know, there are just some things I'd never think of myself. This tip qualifies. I can just see radishes planted between Mike's dahlias this year. Thanks. This year we planted English Breakfast Radishes, they did great, several so far as big as my index finger and I have large hands. Two years ago the soil was not as rich and the radishes did no where as good as this year. Thanks again for the tip MBT! Thought I'd come back to confirm the results and what I did to fix my radish envy issue. Since I garden organically I didn't want to beef up the potassium with a chemical fertilizer. I did some research and still wasn't sure what to use. Then I mentioned this post to my mom when visiting her in April. She said wood ashes are great for adding potassium to the soil. To make it even better, she and her garden buddy heat their home with wood that comes from their property and save the ashes. (They participate in the WI DNR managed forest plan, and every couple of years have a number of trees, (mostly invasives) cut down. Their firewood is never chemically treated, so I brought back a big box of wood ashes, and spread them over the garden. It worked! Rain watered the ashes in (couldn't mix them in the soil since the radishes were already growing,) and for the first time here I've been enjoying normal-sized radishes! I'm sure the added potassium will be good for the other veggies too. Sorry to be a spoil sport, this is a nice blog...but whatever program/software you're using...it's making my cpu use 97-99% of it's capacity. I've tested this by eliminating all the other Firefox 9.0 tabs/websites I'm watching, and this is the one causing the problem. If you can fix the problem, please let me know...I'd like to keep tuning in.